Local author Odessa Rose joins us to discuss her novel, Water in a Broken Glass. The story, set in Baltimore, is a modern love triangle and exploration of sexual identity. "Tonya Mimms, a talented sculptor who puts her artwork above everything, including her thirst for love. One day she meets Malcolm Holland, a handsome accountant with whom she falls in love. Subsequently she meets Satin Pierce, a beautiful female bookstore-owner who has one of Tonya's sculptures in her bedroom. Soon Tonya becomes the centerpiece of a love triangle, in which she finds herself being satisfied by a glass of love that she gulps freely, and a glass that she sips...fearfully." Author Odessa Rose received her B.A. in English from Coppin State University and her M.A. in literature from the University of Maryland at College Park. 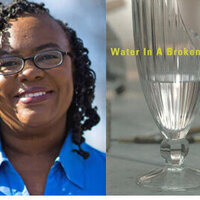 Water in a Broken Glass is on Towson University's "Rainbow Lounge and Resource Library" booklist. It was used in a graduate level course at Wake Forest University and is ranked #17 on "Accredited Online Colleges' 20 Essential Novels for African-American Women" list.